Bottoms are elasticated draw string waist also with contrasting hems and will comfortably fit 30 - 34" waist. Full trouser length from waist is 39" with 28" inside leg. Button up jacket with contrasting collar, cuffs and chest pocket trim. Top is 28" armpit to armpit. 28" inside leg. trousers are 21" across elasticated waist, will stretch more if needed. M&S Mens Pure Cotton Pyjamas Size Small Navy/Red New. Condition is New with tags. Dispatched with Other Courier (3 to 5 days). FRESHLY WASHED & IRONED. SIZE LARGE, BLUE CHECK. 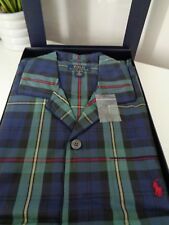 MENS WOLSEY PYJAMAS BLUE/RED/WHITE CHECK.SIZE LARGE.BRAND NEW WITH TAGS. 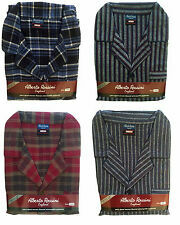 Mens Quality Lounge - Sleep Wear. Super Brushed Cotton Nightshirt By Champion. Button Opening Front And Breast Pocket. 100% Brushed Cotton Wyncette Material. 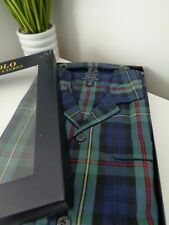 GEORGE SIZE MEDIUM BLUE CHECKED PYJAMAS. BUTTON FRONT. POLYESTER & COTTON. BUTTON FRONT. NEVER BEEN WORN. 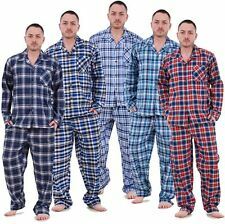 Rael.Brook Men’s Check Pyjamas. Predominantly red in colour. Button front long sleeve top and trousers. Extra Large - Chest 44-46in, Waist 39-41 in. Brand new in packet non smoking household Dispatched with Royal Mail 2nd Class. M&S PURE COTTON CHECK. PURE COTTON. CHEST 47-49IN / WAIST 42-44IN. BUTTON CLOSURE TOP WITH CHEST POCKET. BOTTOMS ELASTICATED WAIST. Rand new 100%cotton pyjamas. They are navy blue, some of photos make them look darker than they actually are. 75% off original price. Mauve and white check to fit up to chest size 46in (117cm). Five-button jacket fastening with full-length cuffed sleeves. 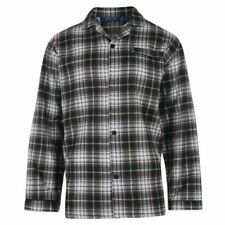 M&S Men's Pure Cotton Check Pyjamas 2 Part Set Full Length Size: S NEW!!! In a classic red and blue wide-set tartan check, they feature a button-up shirt with a patch pocket and contrast piping, and an adjustable elasticated button-fastening waist on the trousers. Neck Shape: Collared neck. Cargo Bay Thermal Pyjamas. 100% Cotton. Mens size XL.